All files that are needed for creating the story are already bundled in a Dossier. Articles and layouts contain the correct components and styling, specifically set up for the Publication Channel in which they will be used. The files have the correct properties assigned such as Publication Channels, Workflow Statuses, and so on. You don't have to spend time searching for the correct files; instead you can use the Dossier templates that your system administrator has set up for you to start working right away. 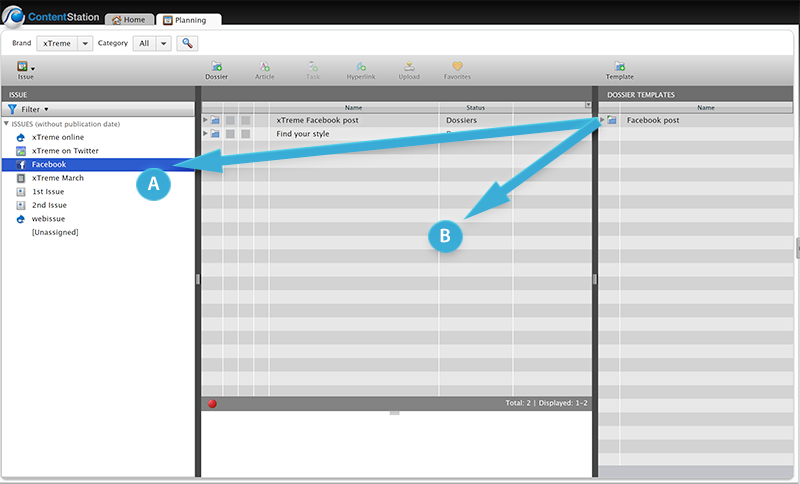 In short, using Dossier templates to create a story makes this process more efficient and less open for errors. Create a new story based on a Dossier template, containing a variety of files such as articles or article templates, Layout templates, Tasks, images and other file types. Create a new article by using the Create Article button in a Dossier (as opposed to using the Create New Article icon on the Home page of Content Station). Create a new layout by basing it on a layout template that is located in a Dossier. Before you can turn a Dossier template into a Dossier, you need to find the correct Dossier template first. Dossier templates are treated as regular files and can appear in the standard locations: your Inbox, the Favorites pane or the Recent Items pane. You can also use the Search Application to search for a Dossier template. 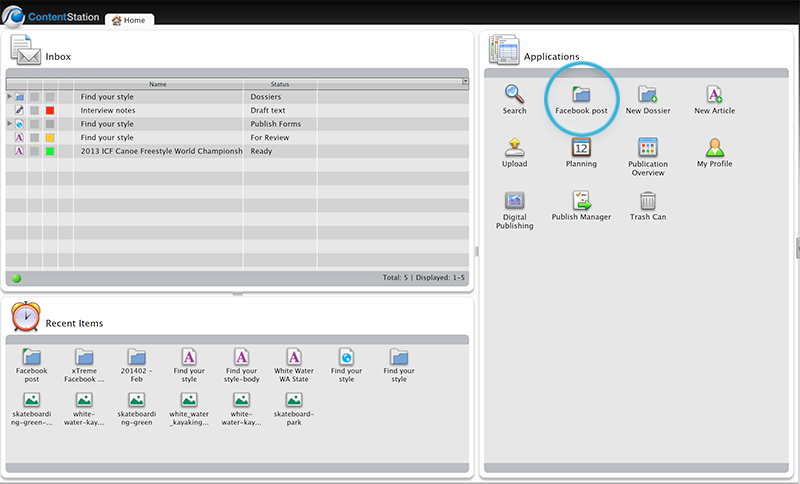 In addition, your system administrator can add Dossier templates as an icon to the Applications pane on the Home screen. 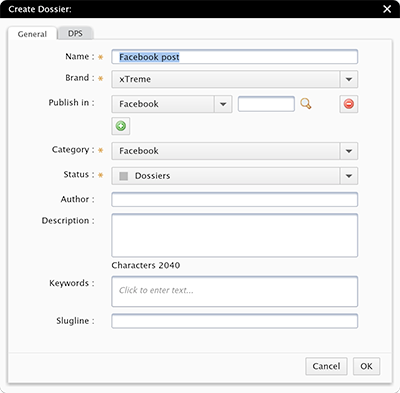 Figure: A Dossier template for creating a Facebook post added to the Applications pane. Double-click the Dossier template anywhere in Content Station. In the Planning Application, select an Issue in the Issue pane and drag the Dossier template into the Dossier pane. In the Planning Application, drag the Dossier template onto an Issue in the Issue pane. Tip: To add the Dossier template even more quickly, hold down the Shift key while dragging; this will prevent the Create Dossier dialog box from appearing (the settings for the Issue onto which the template is dropped are automatically set). Figure: Dragging a Dossier template onto a selected Issue in the Issue pane (A) or onto the Dossier pane (B). The Create Dossier dialog box appears (unless Shift was held while dragging a template onto an Issue, as explained above). Typically, the properties for the Dossier are automatically and correctly set because they are inherited from the Dossier template. Step 2. Enter a name for the Dossier. Step 3. (Optional) Modify any of the Dossier properties. The files that were set up in the Dossier template are created in the Dossier. Note: Depending on their file type, some of these files are created as stand-alone files while others are linked to the original file. For details, see Dossier template behavior in Enterprise 9. The properties of the Dossier and the properties of the files within the Dossier are set. Note: How these properties are set depends on the method of instantiating the Dossier template. For details, see Dossier template behavior in Enterprise 9. If a regular article is present, open it to start writing the content of the story. When only one article template is present, that template is used for creating a new article. When multiple article templates are present, the user has to choose which template to use. When only article templates are present, click the New Article button in the toolbar to create a new article. You will be asked to choose the article template to base the article on. Add files to the Dossier (to use as part of the story or as reference). See Working with Dossiers - Adding files to a Dossier. Right-click the Dossier template and choose Open. Double-click the Dossier template while holding down the Alt key. Select the Dossier template and choose File > Open > Open. Select the Dossier template and press Cmd+E (Mac OS) or Ctrl+E (Windows).